PHITSANULOK, THAILAND: 32 representatives from more than a dozen Thai seed production and processing companies are refining their seed testing quality control knowledge and skills this week with an intensive workshop. 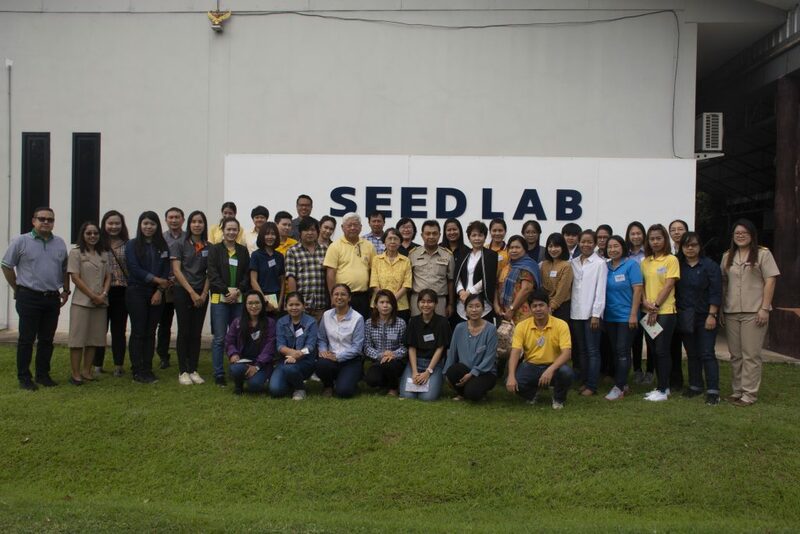 Co-organized by the Thai Seed Trade Association (THASTA) and Thailand’s Department of Agriculture (DOA), the five-day “Seed Testing Quality Control Workshop” is held at the Phitsanulok Seed Research & Development Center (PSRDC). Administered by the DOA, the PSRDC houses Thailand’s first and only public seed lab that is accredited by the International Seed Testing Association (ISTA). Inaugurating the workshop this morning (9 July), PSRDC Director Jira Suwanprasert gave welcome remarks, giving some background information on his center and lab, which was accredited by ISTA earlier this year to certify various types of seeds for international trade. Mr Jira stressed the importance of quality seeds with respect to not only economic prosperity but national food security, likewise. “We encourage you to learn as much as you can here this week. Be active, ask questions and learn. It is our aim that you take what you learn here and use it for the benefit of your companies and country,” he said. Following his address, renowned Thai seed technologist, Dr. Sutevee Sukprakarn gave a keynote speech. A retired Associate Professor from KU’s Horticulture Department, Dr. Sutevee elaborated on the various aspects of “quality seed” with respect to genetic, physical, physiology or seed health aspects. She highlighted one of the most common issues seed producers and processors face — inconsistencies between lab and field results. “We often get asked why seeds don’t perform like they’re suppose to. Controlled conditions in the lab may be completely different from the field or point of sale. This is why it’s essential for you to understand these conditions, and how to regulate and control them in every step of the process — from factory, to storage to shop to field,” she said. Also presiding over the opening was THASTA President, Dr. Chairerg Sagwansupyakorn, who explained the objectives of the workshop. “This workshop is part of efforts to upgrade the standards, skills and knowledge of Thai seed companies in the production of quality seeds, which is in line with public-private initiatives to develop Thailand into a seed production hub,” Dr. Chairerg said. “This is a good opportunity for some of our larger companies like East West Seed and Chiatai, who already have their own ISTA-accredited labs, to join with government officers and scientists to share their expertise with some of our smaller and medium sized companies,” he added. Dr. Papassorn Wattanakulpakin, head of the PSRDC Seed Lab, elaborated on the benefits of private-public collaboration. “We have a lot of good resources in Thailand, in both the public and private sectors. Quality seed standards aren’t new for us. The government and private companies have long adopted international standards (for seed testing quality control), but in the past there’s been some communication gaps. This is a great opportunity for us to coordinate and bring everyone together for the benefit of the entire industry,” she said. Set to close on 13 July, the workshop program features lectures, interactive demonstrations and hands-on laboratory sampling technique training, led by expert seed technologists, scientists and personnel from the DOA, Kasetsart University, and THASTA member companies, including East-West Seed, Chiatai Seeds and the Thai Seed & Agriculture Company. Look out for more photos and insights from the workshop and seed lab in an upcoming edition of Asian Seed.